Alex Smith threw for 178 yards and one touchdown to lead the Washington Redskins to a 16-3 victory over the Tampa Bay Buccaneers on Sunday. TAMPA, Fla. (AP) — Washington yielded 501 yards and forced Tampa Bay to punt once all day. That’s what four takeaways, three of them foiling scoring opportunities, will do for a team that struggles to score points. Smith, who was 19 of 27 with no interceptions, threw 6 yards to Josh Doctson for the game’s only touchdown early in the fourth quarter. Hopkins kicked field goals of 43, 43 and 26 yards, the last set up by Greg Stroman’s fourth-quarter interception and 24-yard return to the Bucs 14. The Bucs, who have the NFL’s top passing attack and are second in total offense, fell to 1-3 in games they’ve gained 500-plus yards this season. Meanwhile, three of their four giveaways thwarted scoring opportunities, including Jacquizz Rodgers’ fumble on a reception that rolled 18 yards into the Washington end zone, where it was recovered by safety Ha Ha Clinton-Dix for a touchback. 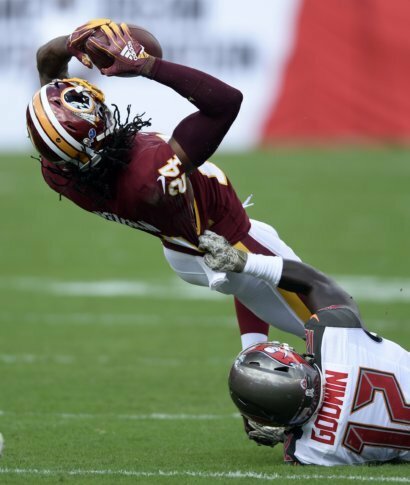 The Bucs moved into Redskins’ territory on all five of their first-half possessions, but had little to show after Norman made a leaping interception on the goal line of a pass intended for Chris Godwin, and Chandler Catanzaro missed a 30-yard field goal. Catanzaro, who’s missed four field goals and four extra points through nine games, also had a 47-yarder sail wide right early in the second half. Washington’s patchwork offensive line held up fairly well. Washington rushed for 116 yards, with Adrian Peterson helping run out the clock and finishing with 68 yards rushing on 19 carries. “It wasn’t like there was a ton that was off-limits, and I think that’s a credit to those guys and how they were playing,” Smith said.